Why, hello there! I hope you had a trevlig helg ('nice weekend' - notice how I subtly drop in new swedish words every now and again - I promise you'll be fluent by the end of the year!). I arrived home on Saturday night from Norway and will be rejoining the cruise in Gothenburg later today for my second talk (*mops brow*). But before I shoot off, I wanted to sit back and enjoy a moment of calm with you! 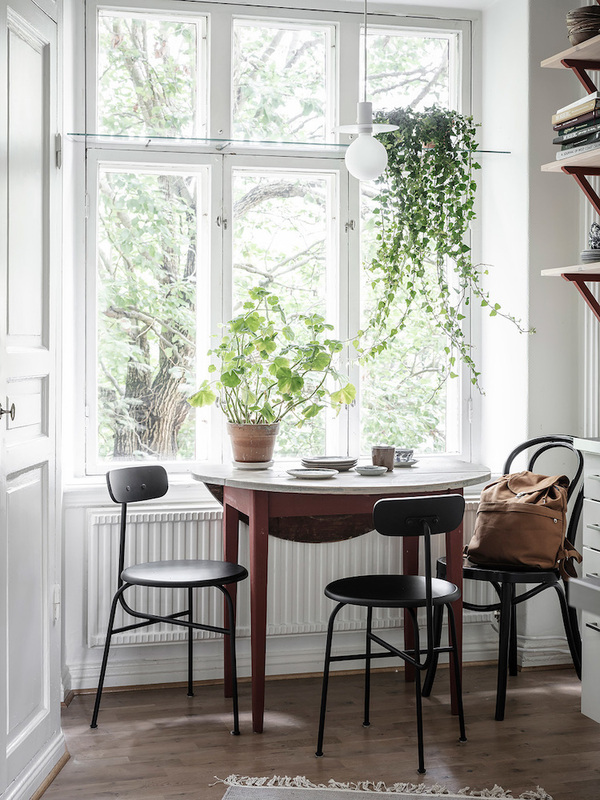 This 46 metre square (495 foot square) Swedish apartment is so soothing for the soul! It's been styled for sale so probably features less items than it ordinarily would, but I'm still feeling massively inspired by the blue walls (could they be painted in Deco Blue? 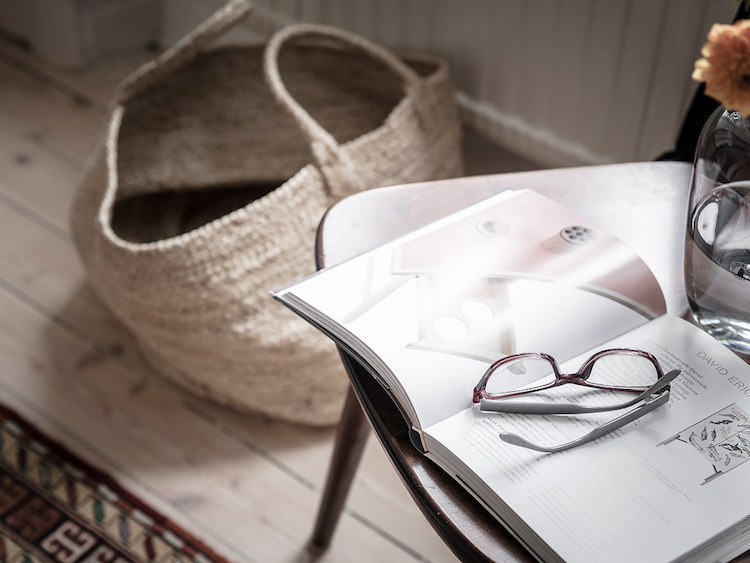 ), subtle autumn hues, the fab Gubi coffee table and Frama light and some very pretty rugs! 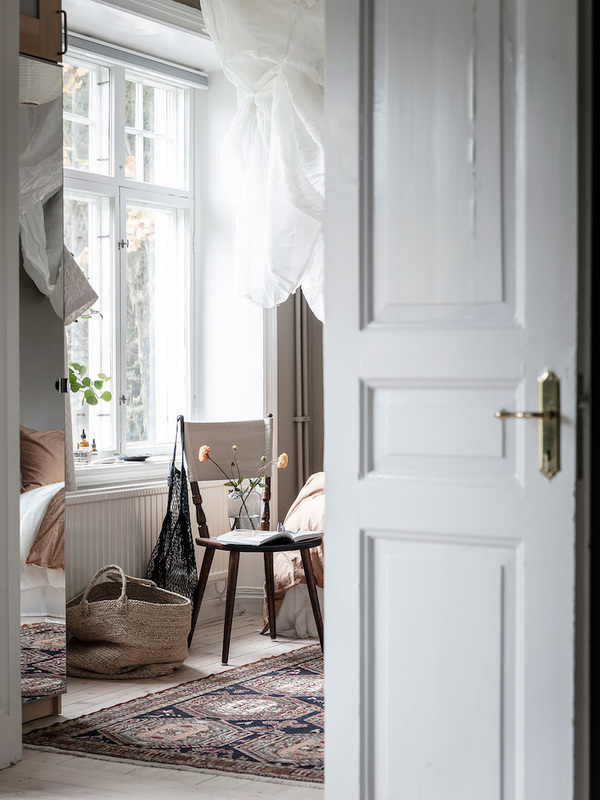 One of the things I've always loved about turn-of-the-century Swedish apartments are the sweeping double doors between rooms. Aren't they wonderful?! It's been a while since I've seen a bed canopy like this - what are your thoughts? I am a little divided but I do appreciate the soft, cloud-like look of it! The colours are what really stand out to me though - the chestnut duvet cover and soft green walls (I just painted my daughter's room in Minty breeze which looks similar). I love the little pendant light over the dining table, it looks like it's wearing a top hat (so cute! )- but no idea of the name! Perhaps you can help? This is the kind of space that you need to look through several times to catch all the details. For example, I've only just noticed the subtle glass shelf high up on the window over the kitchen table. It's the perfect place for a plant! Did you spot anything I haven't? Or perhaps there's something you absolutely loved about this home? Please share away, I love hearing your thoughts! Oh and more blue home inspiration in the fabulous 'decorating with blue' archive. Remember to just scroll passed if this pops up first. 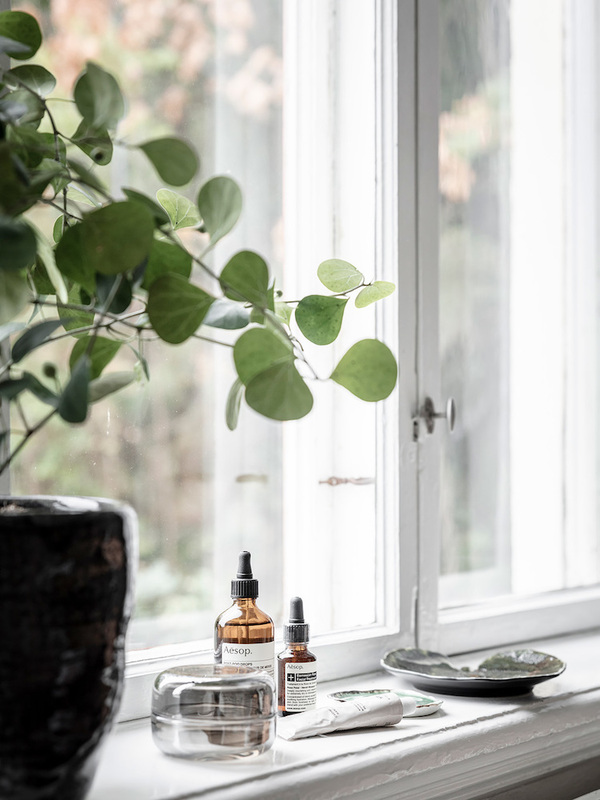 Can someone tell me please what the name of the plant on the windowsill in the first pic is? I keep seeing it in Scandinavian homes, but never here in Canada. Gorgeous home....love the bed canopy! I'm not sure if you noticed the reply by a kind 'unknown' person further down the feed (my reply button seems to be playing up!) so I'm just repeating it here for you: it looks like a miniature fig. Dear Calina, I think it is corokia. I am so very sad today, my parents house was flooded in Florence. Your blog cheers me! Which I needed today. Thank you. Oh no, I'm so sorry to hear that. I'm happy to hear my blog managed to bring a little sunshine to your day. The plant is a minature fig. A gorgeous home! 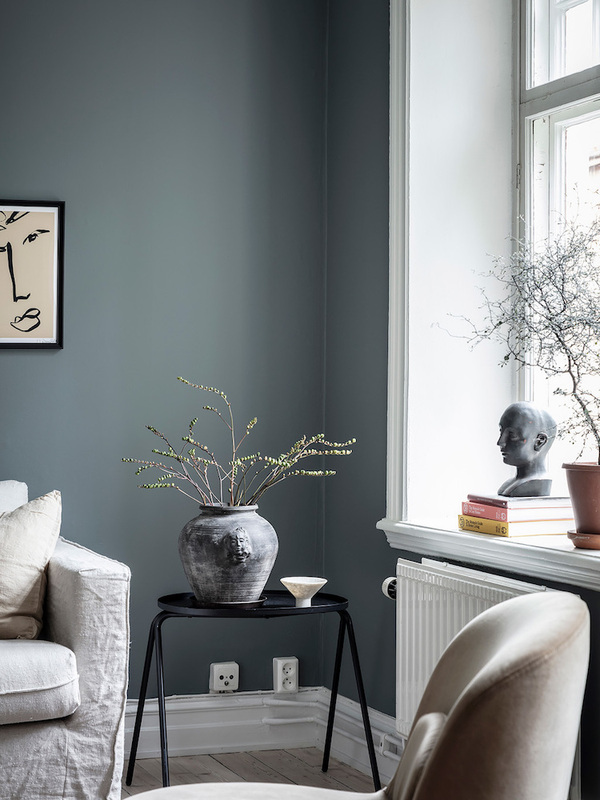 The living room is painted in a beautiful color. Do any og you know what it's called? I searched up deco blue, and I do not think that´s the one. It's a beautiful shade of blue! Unfortunately I'm not sure what it's called - I hope someone else can help. Me too - it's got a lovely grey tint to it which makes it really calm. 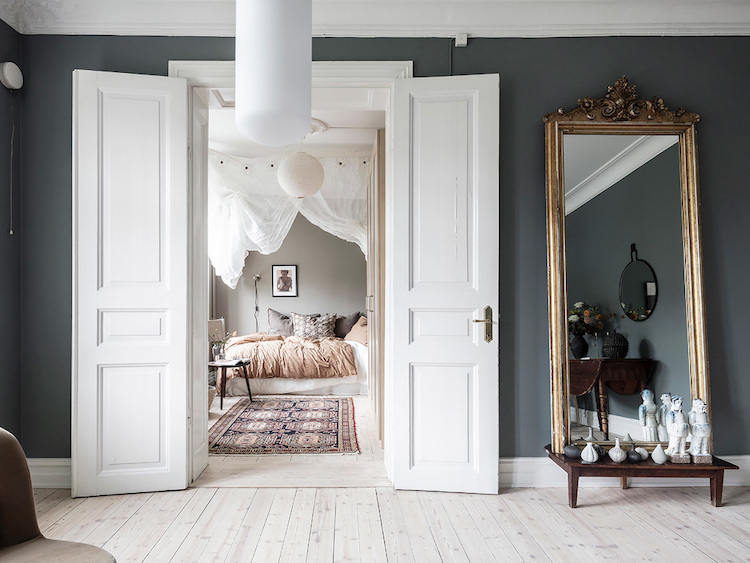 Loving the rugs in the living room space and bedroom. This person has excellent taste! 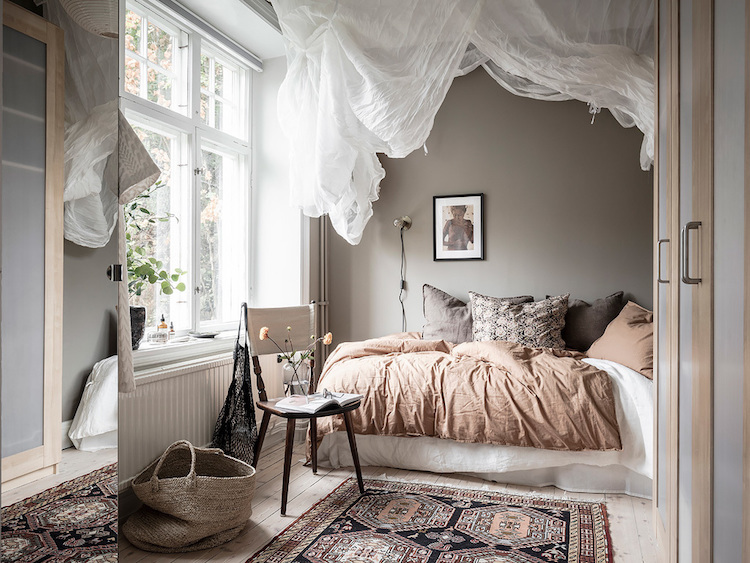 :) The canopy definitely adds a dream-like state to the room. I'm with you on that - I especially love the rug in the sitting room, it's so pretty! 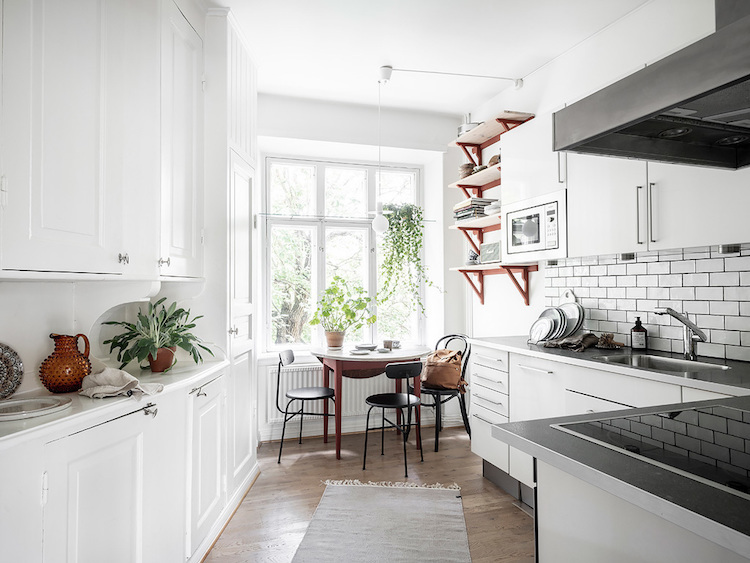 I love Scandinavian style, bright interiors, connections with wood, in my opinion there is no better :) Soon we move to a new home, but before we have to arrange all interiors and know how to do it :) I can not wait. 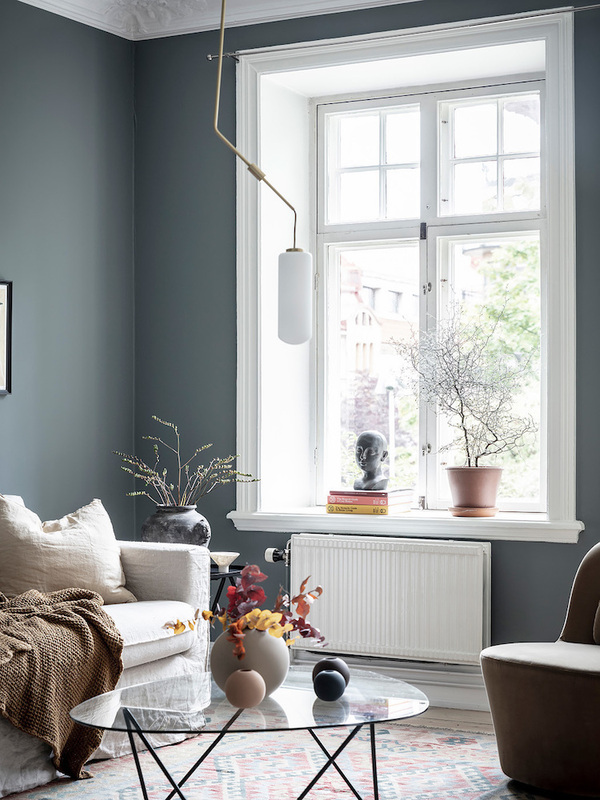 I've used a similar color (Sea Salt) in my kitchen, living room, hallway and a contrasting color, Comfort Grey in my bath, and bedrooms. Both colors are calming and soothing. Love the earthy blue walls! I keep seeing these lovely pale wood floors. Do you know if existing hardwood can be bleached to get this effect? 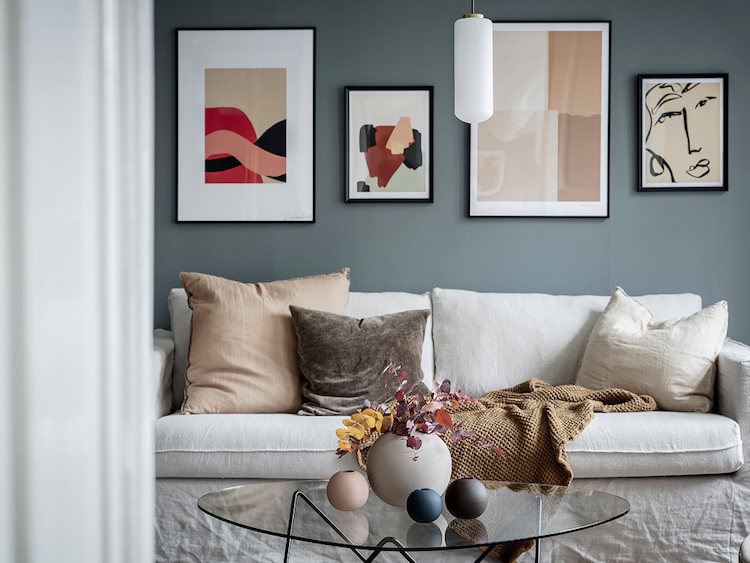 Does anyone know where the sofa is from?